Mark Wager – Page 2 – Love God… Love People… Live Free! My name is Mark Wager. What does it mean to “Rescue The Beauty”? My friends and I recently returned from hosting our 4th LIFEQUESTweekend event. (I’ve posted previously about these events.) We love doing these events and hope they change lives, mine included! As any person who takes on the role of a “guide” or “teacher” or “public speaker” will tell you, what we’re really offering is our lives. So, it’s not just about mastering the material, it’s about living it, letting it have it’s affect on you. It’s one of the things I’ve come to enjoy about these events, with all the preparation and planning, etc., it’s the impact “the message” has on my own life. This time was no exception. I don’t want to just learn the words, I want to learn how to really live. So, this year I did something really risky — I asked my wife to “give it to me straight” about one of the main topics we cover in our weekend event. I asked my wife to tell me, “What does it mean to ‘Rescue The Beauty’?” And more specifically, what does it look like, feel like, sound like for me to rescue YOU? If you’ve followed my blog recently and read my previous postings “Bringing Our Unique Self to the Surface” and “A Powerful Grip” you’ll know from where this next story comes. Let me say right off, the LoveGodLovePeopleLiveFree.com blog is not really a “short story” forum. It is about finding life and freedom by living out our stories, our hopes and dreams, our faith, in genuine and unfolding ways. So, I’m posting these couple of stories because they are part of my journey to find my calling, my passions, my purpose. I hope they inspire you to step into whatever stirs your heart. Atop a small hill in a not so far away place stands an old house. Picture in your mind an English country mansion, not that it is English or a true mansion for that matter, but whatever it is (or was) it stands large and majestic, tall and proud and generous with its brick and stone and timber. The house has a dozen windows facing a large lawn with trees and flowers and stonework. And on the other side are a dozen more windows facing a large courtyard. The courtyard hasn’t seen any use for years. Back in the early days it was a magnificent place full of life and laughter and play. Grand parties and social functions were common. It was, at its core, a gathering place. Oh, how we need our gathering places. In recent years the house has fallen into a state of disrepair. The windows through which once flowed sunlight, and from every indication, life itself, now seem dull and cloudy. The blinds on many rooms are drawn, not opened in years. The setting out front, however, rests in stark contrast to the inside. While the inside of the house has grown dark and worn and aged, the front lawn is a work of perfection. Cleanly cut grass. Rows of beautifully arranged flowers of all colors and sizes. Shrubs neatly manicured and shaped in whimsical, almost playful designs are planted in each corner of the property. It is not uncommon to see Mr. Lynch, the house’s owner, out front working on his landscaping. It seems a bit peculiar as I consider it, that for all the times I’ve seen Mr. Lynch outside, neat and polite, I’ve never seen anyone go inside the house. In fact, as I think back, I’ve never seen or heard of anyone being allowed to even approach the house itself, save for one man. Each week, at the same time of day, a man would stop by the old house. His routine, and his intentions, were the same every day. And yet for all his desire and persistence he could never get himself to knock on the front door. Each time was the same. In his hand he carried a small white envelope. It was stamped and addressed, hand-written in pen and in clear print, thoughtful and deliberate. The letter could have been mailed, but as intention seemed to predominate, he held the envelope tightly in his hand and delivered it in anonymous fashion. This posting is a departure of sorts from my usual posts, but I felt compelled to post it. And so, out of obedience and with great compassion and sensitivity I offer this poem (below) written several years ago. For years I struggled to put into words my life as a child, teen, and into my 20’s. And I needed to put words to it. We cannot move into the next chapter of our lives without closing the previous chapter. To do so without a healthy completeness leaves a gap. It’s like leaving blank pages that must be written for the story to really continue. This poem helped. A Thought: The ultimate failure of humanity is arrogance. It was the end of another long, hot day at work. Frank was relieved to finally be making his way out of the factory. He took his usual path out, making his way through the maze of halls and stairwells, past the offices (the “brains” of the operation as those inside were known to have refer to themselves), and toward the huge bay doors that would ultimately find him his way outside, to freedom. In almost every regard, it was a day like any other day. That is, until the incident. The factory was busy today. 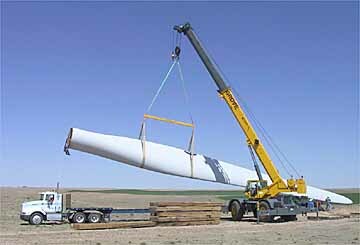 The usually order, at least it was thought to be order, or more like orchestrated chaos, the usual order of the factory moving huge wind farm turbine blades by crane, it is almost a ballet. It was a dance like any other day until by mere coincidence the chain reaction was set in motion. No one knows exactly how it got started, but today the rhythm of the cranes as they moved and slung their suspended cargo from here to there, changed. It began with an operator on the 3rd line. An oscillation really, nothing that appeared jarring or abrupt, but a simple over-compensation was made. And it began a slow-moving swinging movement that was to be the end of Frank’s life as he knew it. Frank was making his way to the 3rd bay door. Large doors, maybe 100ft tall. He could see the light of day, he could almost feel the warmth of the sun on his face. Then as he was about to take his final liberating step out of the large open door he noticed the swinging – it was out of control. Not that Frank could do anything about this, normally. He was, after all a maintenance worker. Powerless in almost every sense of the word. But, today something shifted. As he watched the unraveling begin, he sensed something… THE STORY CONTINUES – Click to view the rest of the story. Or, Click HERE for an AUDIO version of the story read by myself. Ok… I’m going to admit something really embarrassing. (Be kind!) “You know this song is about Jesus dying!”, I said. [U2’s ‘Sunday, Bloody Sunday’ was playing in the background.] And as suddenly as the words left my mouth there began a very obvious and very awkward pause. “No…”, said one of the 5 guys gathered around, “it was about a Massacre in Ireland!” I felt so embarrassed. It was humiliating. My plan was to cleverly join in the conversation, to sound like I knew what I was talking about, to fake my way through, but it had failed. I was completely wrong. I was utterly exposed. And even now after years have passed, it is hard to expose this to you. It still feels embarrassing. And it still tempts me toward the urge to hide… to pose as something I’m not yet. We had a home appraisal recently. It was part of a refinance for our home. When the appraisal was over, I began talking to my wife about it. The whole process got me thinking about how life can be like our appraisal. In my last post, Luke Skywalker was getting schooled by Yoda in some basic truths about faith… and we applied this conversation to our own lives realizing that, like Luke, it is our lack of belief that brings our failures more than our lack of ability. It is our lack of belief that God can and will come through for us that causes us to hesitate, shy away from action, stand back and “wait to see what happens”. It is why we “try” instead of “do!” It is a faithless way to live… a belief-less way to see the world and our role in this story in which we live. My wife and I have been married for 27 years. I’m not bragging… I’m just mentioning it so you can that when I talk about getting to know each other, we’ve spent a long time trying. We’ve tried a great many things to stay connected, and we know how challenging it is. You’d think after 27 years we’d be able to coast, that we’d know everything we need to know about each other… maybe you’ve thought that about relationships in your life — friendships, family, girlfriend/boyfriend, spouse. Maybe you’ve thought because of the extended proximity to another person that you can now coast. In my experience, it is not true. People are alive… they change and grow and form new thoughts all the time. So it makes sense… relationships take ongoing, intentional effort, forever. Occasionally, I re-post writings from others when I think they have things to say that fit our theme of journeying and learning to Love God… Love People… and Live Free! As I considered my entry from a couple of weeks ago about “Interpreting Guilt“, today’s topic seems to fit perfectly. Here is a verbatim re-post of some great thoughts from a blog I follow. I think you’ll find it helpful and freeing. I’m reading a book published a few years ago, “What the Dog Saw”, by Malcolm Gladwell. I love these quirky books about what makes people and society tick. So, as I’m reading a chapter in this book about “LATE BLOOMERS” it hits me how true this is true for so many of us. Whether or not you’re a late bloomer I believe you’ll see why I think this is so important for us ALL to know. Changing our understanding about this could radically change the people around you… and it could radically change how you view yourself. I had a conversation with someone recently about guilt. They felt that someone had been making them feel guilty about not giving enough to a certain cause. They really didn’t like feeling guilt (and after all, who really does?) and that dislike of the feeling itself seemed to make them resentful of the person making them feel it. This conversation started me thinking about this whole topic of guilt. Because if ‘guilt’ can have the effect of causing/harbouring resentment, then it seems a dangerous thing. Or it is at least a dangerous thing to leave unprocessed. Is guilt a good thing? Should we avoid feeling guilt? Or does guilt reveal something deeper within?… something life-giving, even?